Senior Congress leader D. K. Shivakumar on Friday pacified his fellow party members that missed out on a cabinet berth, saying that even he was excluded from the same in previous governments. "I myself also was kept off the government (cabinet) earlier in Dharam Singh's government. I had patience and belief in the high command, in Sonia Gandhi and Rahul Gandhi. 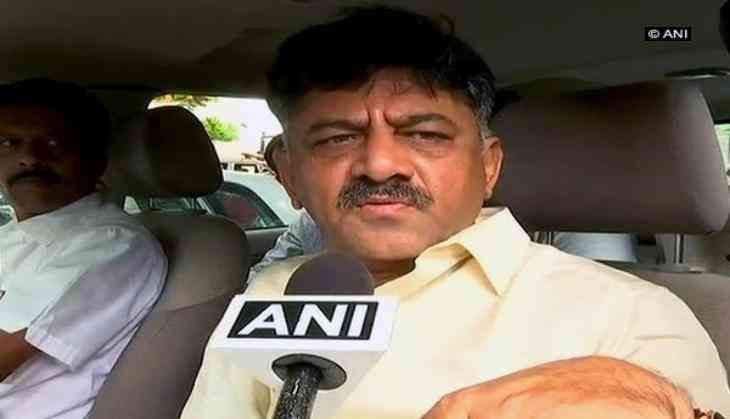 Ultimately, they both give us justice," Shivakumar told ANI. "It is obvious that the senior leaders were hurt. Congress party has kept all options open to fill the vacancies and it will be done soon," he added. In reply to questions pertaining to supporters of some Congress members stopping the vehicle of Deputy Chief Minister G. Parameshwara, he said, "It is quite natural, the same supporters were cheering me no? We have to build confidence among party workers, the rest we will work out soon." The Congress-Janata Dal (Secular) alliance government on June 1 announced the allotment of portfolios among them. While the grand old party was given charge of 22 ministries, including home, irrigation, health, agriculture and women and child welfare ministries; 12 ministries, including finance and excise, public works department, education, tourism, and transport ministries were allocated to the JD(S). Meanwhile, an independent candidate, Shankar, and N. Mahesh of the Bahujan Samaj Party, were allotted one cabinet berth each. However, M.B. Patil, Dinesh Gundu Rao, H.K. Patil, Shyamnur Shivashankarappa, Tanvir Sait, Satish Jarkhiholi, N.A. Harris, Dr Sudhakar, Rahim Khan, Bhyrati Basavaraju, S. Shivalli, Satish Jarakiholi, Eshwar Khandre, Roshan Baig, Ramalinga Reddy, and M.T.B. Nagaraj from the Congress party were not given charge of any portfolio. In this regard, protests were staged on Thursday by supporters of the leaders, mainly Roshan Baig and Ramalinga Reddy.